These weathervanes are painted in really beautiful vibrant colours. The cockerel is very colourful, the pole is silver and the arrows and directions are gold. Each weathervane is complete with lovely detailing to add that extra special touch! Cast iron weather vane with angle bracket for wall mounting. Hand-painted with cockerel decoration. THIS IS A REPRODUCTION IT IS NOT AN ORIGINAL . Weight: 4.90kg. Link to youtube clip of it in action. This is an original design, developed and tested in the peak district. Regards Lee. Little man made of perspex with hatchet cutting up logs, driven from the action of the wind. Based on my original whirligig design. Heres a link to see it woirking on youtube. Design is blacksmith. 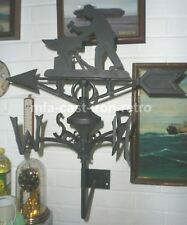 Cast iron weather vane, painted black with bracket for ridge-mounting. THIS IS A REPRODUCTION IT IS NOT AN ORIGINAL . Grace the top of your flagpole with one of our hand crafted eagles. These eagles are cast in rust free aluminum. Hand Cast Aluminum. Gold Bronze Finish. These weathervanes are painted all black to give them a silhouette effect, and are also complete with lovely detailing to add that extra special touch! Cast Iron, Collectables & Gifts. Mandy Likes: The unique silhouette effect. RUNNER MOTIF. MILD STEEL SELF COLOUR. 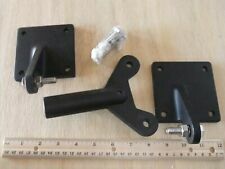 FOR WEATHER VANE OR GATE DETAIL. Socketry Tools Impact Socketry Socket Accessories Socket Sets Ratchet Handles Swivel Bars. These weathervanes are painted in really beautiful vibrant colours. The Land Rover is blue and white in colour, the pole is silver and the arrows and directions are gold. Birdbath/Feeder w/Stake - Blue. JUST LET US KNOW. Size: 12"X12" 25". UPC Code: 657641109199. 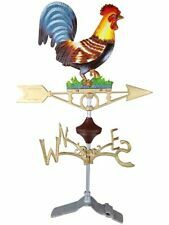 Primitive Country Metal & Wood Angel Weather Vane Tabletop Home Garden Decor 22"
This is more of a decorative item than an actual wind indicator. Angel does spin and trumpet is a separate piece which rests in her hands. Angel Weather Vane. Not quite a Spit or Hurricane but a mix of the two, spins on pivot pole to follow the wind and always keep the propeller in the wind spinning away. 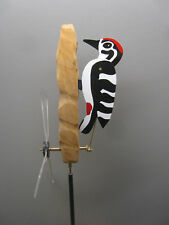 kinetic wind art , windvane. Fishing man, when the wind blows he starts fishing. Roughly woodpecker sized, the pole is approx 14". Whirling Wendel. As the wind blows round he goes. Regards Lee. 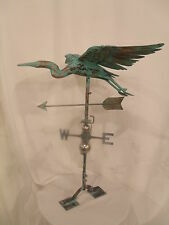 UP FOR CONSIDERATION IS THIS NEW NICELY DETAILED HAND CRAFTED FLYING EAGLE WEATHER VANE WITH A ANTIQUED COPPER FINISH. fencing foil, lungeing fencer, fencing equipment, automaton. Turn the handle and The Fencer practices his lunges. Not quite a Spit or Hurricane but a mix of the two, spins on pivot pole to follow the wind and always keep the propeller in the wind spinning away. Easy to fix to shed roof, fence etc with supplied pole and screws. Blade spins in the wind and the Woody pecks away! 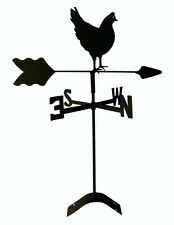 THIS BLACK WROUGHT IRON WEATHERVANE IS MADE TO GO IN THE YARD OR GARDEN. 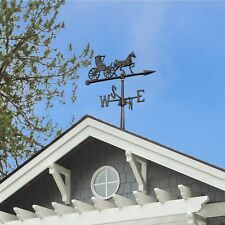 Another option in this size and color is the Horse Accent Weathervane Give it a look! This weathervane features a handmade aluminum casting that showcases an intricate and detailed nautical design. Made per order. 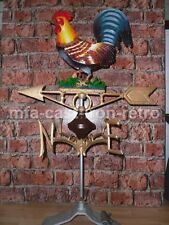 VINTAGE CAST ALUMINUM ROOSTER WEATHERVANE 17 3/4"
Hand cast with recycled aluminum. Proudly made in the USA. 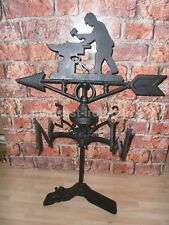 Cast iron weather vane with mounting bracket for building ridge. Painted with cockerel decoration. THIS IS A REPRODUCTION IT IS NOT AN ORIGINAL . 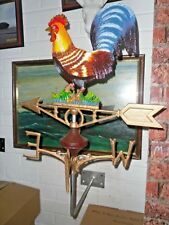 Weight: 5.20k g.
A stunning looking weather vane byPrimus featuring fantastic detailing of a beautiful peacock! Material:Stainless Steel. VINTAGE IRON PIG WEATHER VANE. 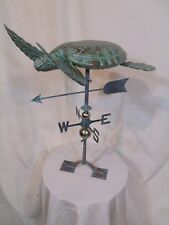 A stunning looking weather vane byPrimus featuring fantastic detailing of a flying bird! Material:Stainless Steel. Dalvento, LLC Mini Fini's Roman Rooftop Finial 36"